Recently I was driving along a state route and came upon a farmhouse that was for sale. As I slowed down to take a better look, I saw that it was amazing. It was all white with a porch and a few out-buildings. I thought about turning around, but decided not to. Moving is not an option…so why put myself through that? I tried to dismiss it from my mind but I thought about that house all day. 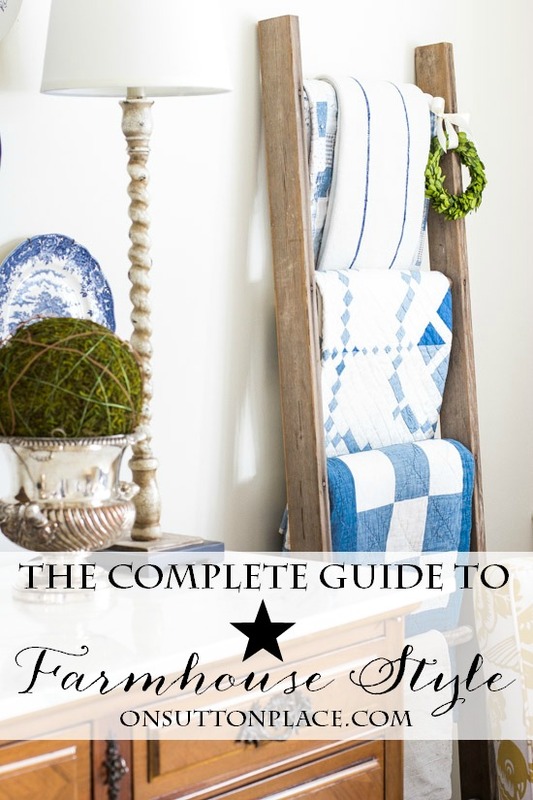 So…I decided to round up all my Farmhouse Style ideas in one place. I went back through everything to see where I could easily add something new and different to my decor. Something that might make me FEEL like I lived in a farmhouse even though I don’t. I’ll share what I decided later. 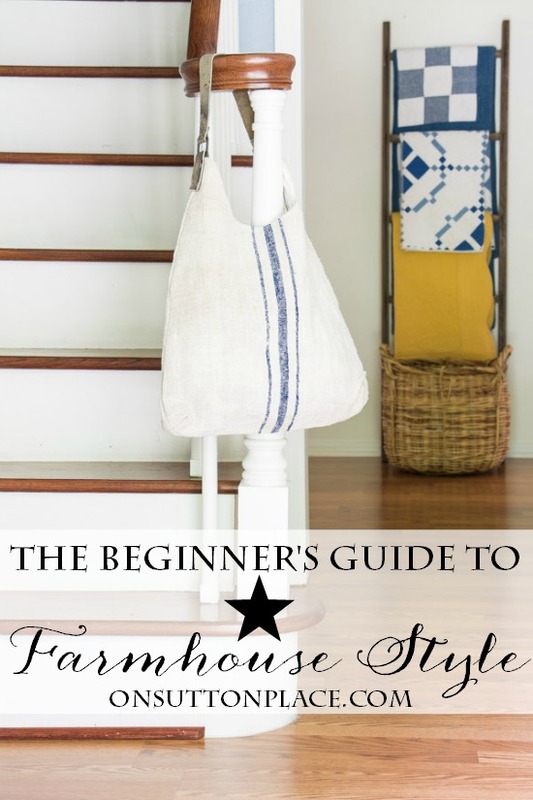 First let’s take a look at the basic elements of Farmhouse Style. The main elements of Farmhouse Style are: light walls, wood floors, vintage or vintage-inspired accessories, natural textiles and open shelving. For more information and lots of examples just click HERE. Rarely do we get the chance to start completely from scratch with our decor…even though we may want to! So it’s necessary to use what we already have and somehow make it work. Farmhouse style elements are easy to add and some are really budget-friendly. 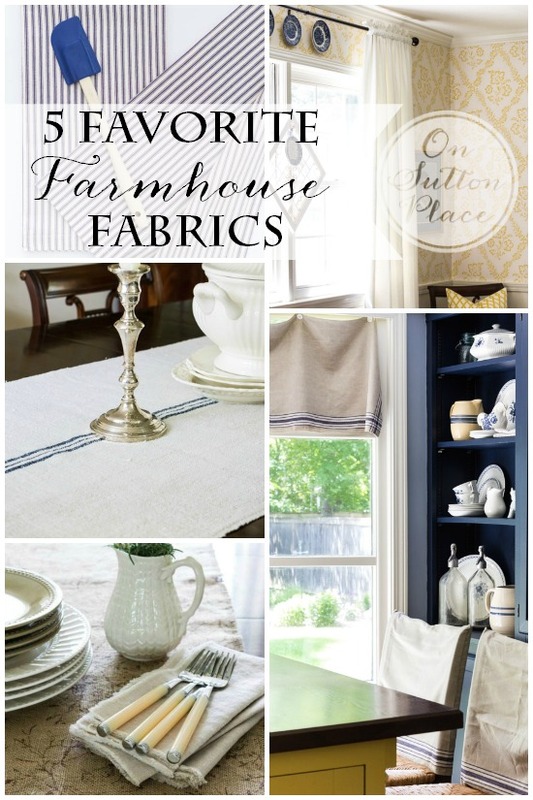 One of the easiest ways to add a touch of Farmhouse is with fabric. Click HERE for examples and some sources. This is where I am going to add something fresh to my own decor. I have some grain sacks and ticking left from other projects. I hope to find the time to sew some pillow covers or maybe a runner. 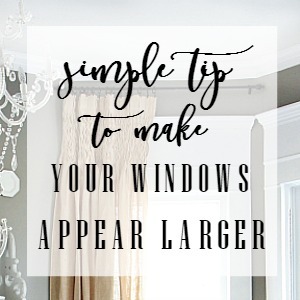 Even something that simple will bring tired decor back to life. Here is where you can get a fresh look by just moving things around…or adding something new to your collection. I love every piece of my ironstone but would love a few fresh pieces. When I can, I hope to get out to my antique mall and see what I can find. I also have room on my ladder for one more quilt if I get lucky in that respect too. If you don’t have room for new pieces or don’t want to spend the money, just move what you already have around a bit. Keep your collections together but give them a different resting place. For much more on decorating with collections click HERE. If you want just a touch of farmhouse style, a great place to start is an outdoor space…a porch if you have one. 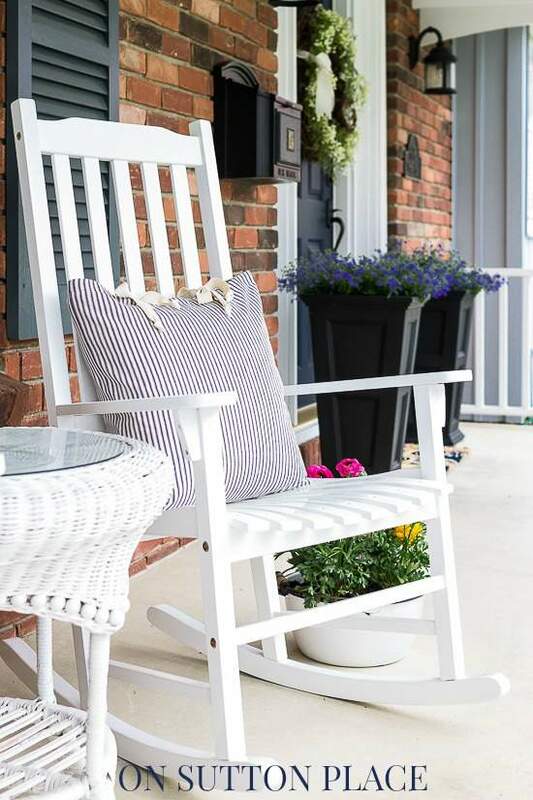 My front porch is not even close to what is found on a real farmhouse…but by adding a few key elements I can get the look without a big price tag. White wood rockers are a great start. Colorful flowers in vintage containers and pillows made from ticking finish the look. Click HERE to see more. 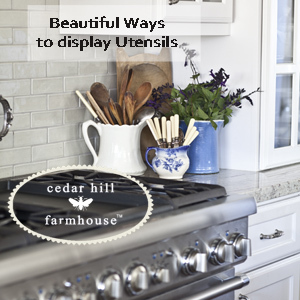 So…whether or not you live in a real farmhouse, I hope these ideas have inspired you. For even more inspiration, my farmhouse friends are joining me and let me tell you, nobody does farmhouse better than these three women. If you have a minute, take a look! These chairs are just the ticket! I’ve seen them for years but never bought any. While my husband and I considered padded chairs and ottomans for our side porch, we never bought them. This year I’m buying the white rockers to go with our white swing. Next will be ticking pillows! Ann, I love all your ideas. Thank you so much for sharing. Ann, I’ve dropped a few of my favorite blogs because their sites crash my computer. I’m guessing sponsors with too many cookies. Appreciate whatever you are doing with your site that allows me to view your blog without problems. I ordered some of those egg noodles can’t wait to try your recipe. Thanks for all your creative ideas & work and for sharing. I love it all Ann. You do farmhouse right. I love your style. I’m a grainsack and ironstone girl myself. trying to find a way to get inside……..for a look. porches on 3 sides, etc. Good idea to start at home………..
Ann, I absolutely love the lamp in your first picture. I’m having a terrible time finding a tall table lamp we can read by. Where did you find that treasure? Hi Joan…I have had those lamps so long that I don’t remember exactly where they came from. They were from a mail order catalog back in the days before the internet. I’m sorry I can’t be of more help! Believe it or not, you have just defined my mother’s style to a T, and the photos show how to enhance her home in the middle of the city more of the flavor she likes. For me: I love the silverware with the yellow handles. Where can I get a set? Thank you for what you do. Your messages are like sunshine in my e-mail box. Hi, from Oleiros, Castelo Branco in Portugal country side. I really like your blog and I’m always looking for new and beautiful ideas to recreate in my house . I have a Portuguese farmhouse, built by my grandfather and restored by my parents. I love my home and I’m always trying to improve it. Maybe one day I can send you some pictures! :) Thank you for the ideas you have given me. Oh, Ann! 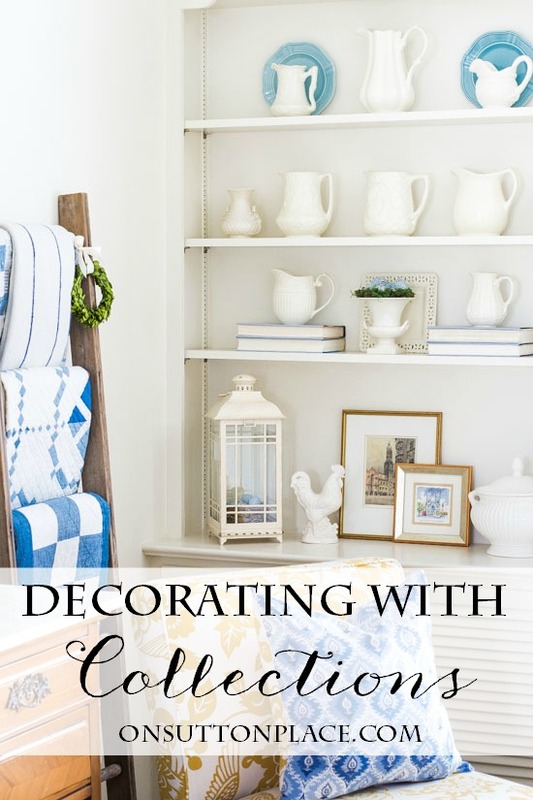 You have a virtual library of farmhouse decorating charm. What a great resource. I love your home and I always leave happy and inspired! I love farm house style, but I am not in favor of painted wood. I love the patina of old wood pieces. I do like some painted furniture but l love your nice chest with the marble top. The warmth of that wood is comforting! Great post. I love farmhouse style and it has become so desired with the popularity of Fixer Upper on HGTV. I love the touches you’ve suggested. Love your style. My favorite picture is of the shelving. I love open shelving. Unfortunately, my husband and I are polar opposites on most home decor issues. Too bad I didn’t get one of those “whatever you want, honey” kind of husband but I think I’ll keep him anyway. LOL. So what we have is a compromise. A little bit country and a little bit not. Lovely tips, Ann. You know I’m all about the farmhouse look and you have totally inspired me today! Oh Lori have fun! You are living my dream girl. :) I have two Pinterest boards you might like. One is called Decorate | Kitchens and the other is Decorate | Farmhouse. Take a look for some inspiration. Good luck! So beautiful! I especially love watching the various transitions you make with your front porch. I do not have much of an entry space, but you have inspired me to do something fun outside my front door this year. I love the tall flower urns you have. Do you remember where you found them? They have been on my radar for a long time. Good luck with your porch!